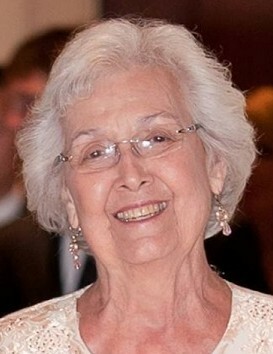 Martha Jones, 87, of Auburn Alabama peacefully went home to be with Jesus, her Lord and Savior, on January 30th, 2019. She was at her home surrounded by family just as she wished it to be. Martha was born on July 30th, 1931 in Hampton, Virginia to the late Walter and Ima Rice. She graduated from Cliff High School in 1949 where she was a cheerleader and R.O.T.C. honorary cadet. Martha attended Auburn University where she was in the Alpha Delta Pi sorority. Her career spanned over 40 years in banking, working at both Farmer’s National Bank and Auburn Bank. Martha served as an officer in each bank. Coworkers and customers would both agree that she had a loving and helpful personality. However, her real love in life was her family, whom she greatly adored. From children to grandchildren to great-grandchildren, she made each one feel as though they were her favorite. Each family member would agree that she was a true angel on earth; she will forever be greatly missed and deeply loved. She was preceded in death by her husband, William (Bill) Jones; sister, Dorothy Nelson; brother, Walter Rice, Jr.; and stepson, Delton (Bubba) Jones. She is survived by her daughters: Kathy Henricks (and her children Katie, Tommy and Heather), Kim Davis and her husband Jim (and their children Shelly, Trent, and Josh), and Peggy Smith and her husband Warren (and her children Tanner and Trevor); and her thirteen great-grandchildren (Caden, Grey, Londyn, Tinsley, Blakely, Hannah, Daniel, Luke, Brock, Emma, Abi, Savannah, and Owen). Her celebration of life will be Sunday, Feb 10th at 3pm at Farmville Baptist Church in Auburn, AL. Immediately following, the family invites friends and family to gather for refreshments and fellowship at 1101 Willow Run Opelika, AL 36801. In lieu of flowers, the family requests donations to be made to the Breast Cancer Association (https://donate.nationalbreastcancer.org) in memory of Martha Jones.